Too many Jews (King:) Too many Jews to keep under my thumb Too many Jews & many more will come. Let's give them the grottiest work! We don’t want to see. 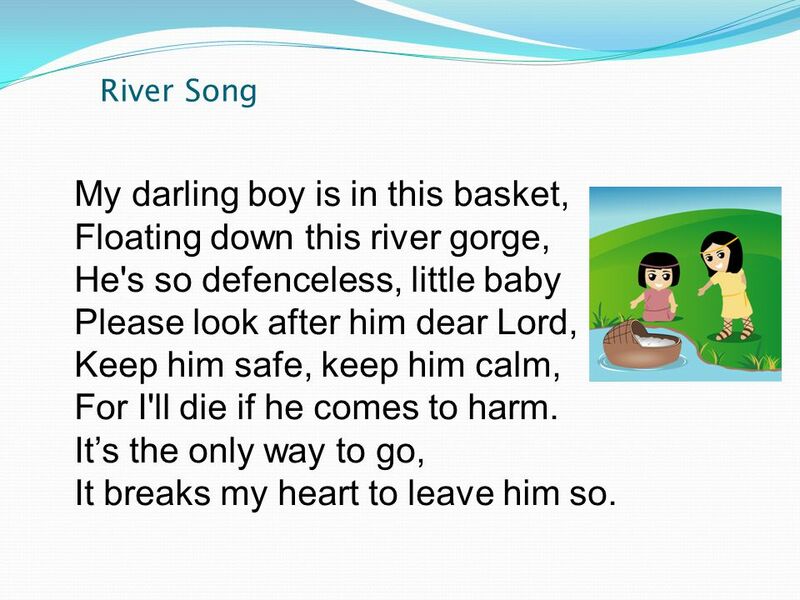 3 River Song My darling boy is in this basket, Floating down this river gorge, He's so defenceless, little baby Please look after him dear Lord, Keep him safe, keep him calm, For I'll die if he comes to harm. It’s the only way to go, It breaks my heart to leave him so. 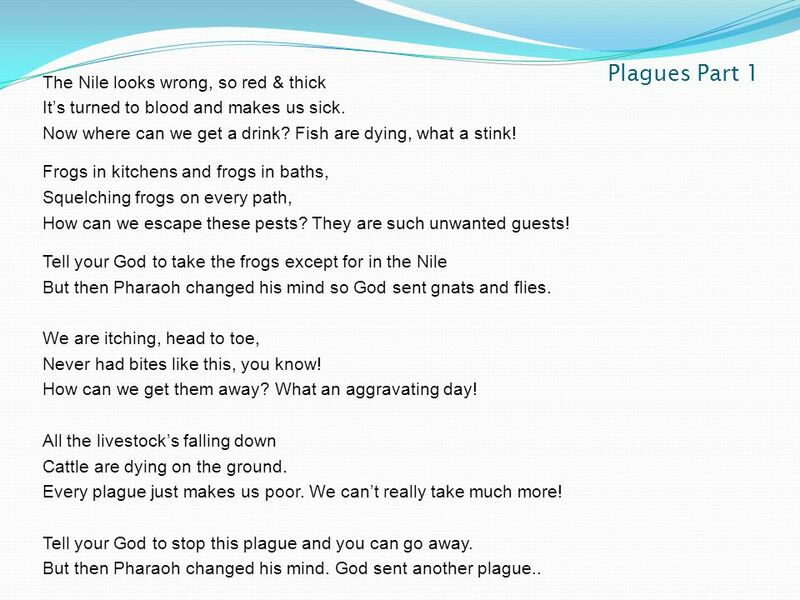 6 Plagues Part 1 The Nile looks wrong, so red & thick It’s turned to blood and makes us sick. Now where can we get a drink? Fish are dying, what a stink! Frogs in kitchens and frogs in baths, Squelching frogs on every path, How can we escape these pests? They are such unwanted guests! Tell your God to take the frogs except for in the Nile But then Pharaoh changed his mind so God sent gnats and flies. We are itching, head to toe, Never had bites like this, you know! How can we get them away? What an aggravating day! All the livestock’s falling down Cattle are dying on the ground. Every plague just makes us poor. We can’t really take much more! Tell your God to stop this plague and you can go away. But then Pharaoh changed his mind. God sent another plague..
7 Plagues Part 2 Look at all our boils and sores. We don’t know what it’s all for! Why can’t Pharaoh just give in?. He must know he cannot win. Here come hail and thunderstorms. Knocking people to the floor. Quick take cover, go inside. Otherwise you’ll surely die Tell your God to stop the storms and you can go away. 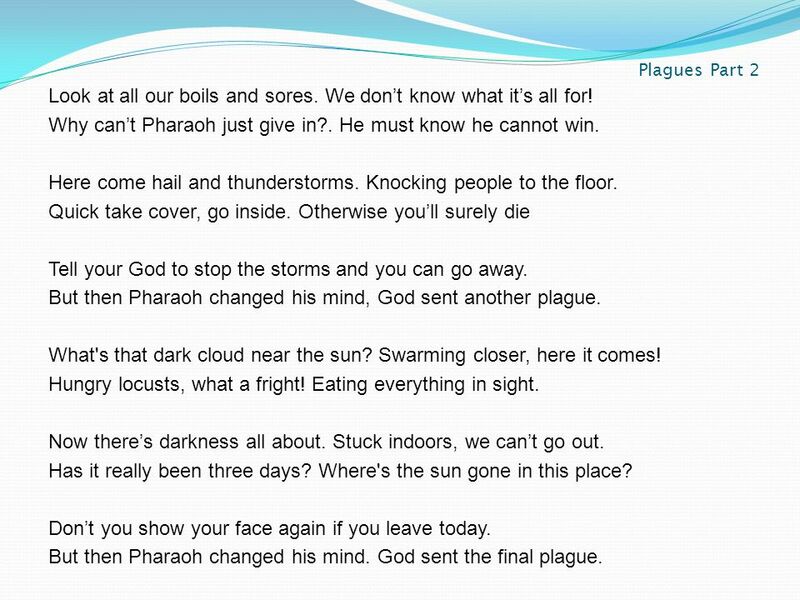 But then Pharaoh changed his mind, God sent another plague. What's that dark cloud near the sun? Swarming closer, here it comes! Hungry locusts, what a fright! Eating everything in sight. Now there’s darkness all about. Stuck indoors, we can’t go out. Has it really been three days? Where's the sun gone in this place? Don’t you show your face again if you leave today. But then Pharaoh changed his mind. God sent the final plague. 8 Angel of Death Angel of death stretch out icy fingers Kill every firstborn, rich and poor. 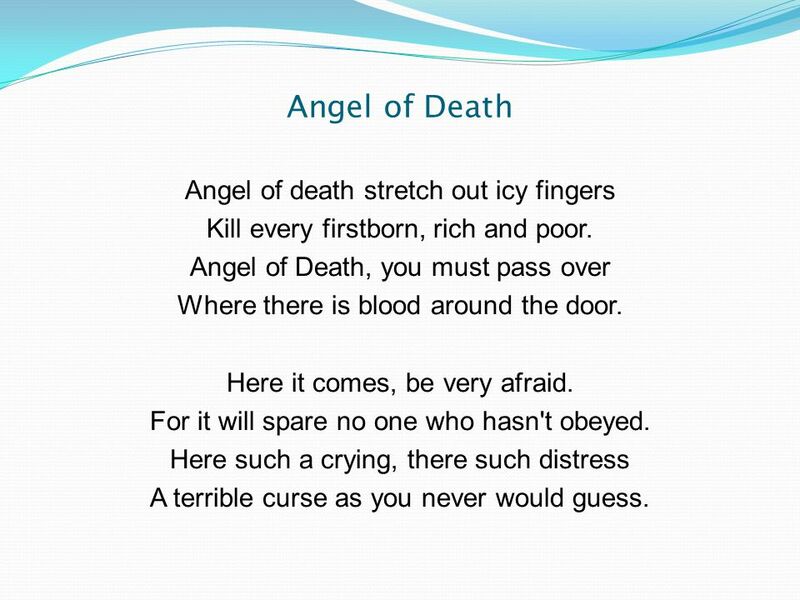 Angel of Death, you must pass over Where there is blood around the door. Here it comes, be very afraid. For it will spare no one who hasn't obeyed. Here such a crying, there such distress A terrible curse as you never would guess. 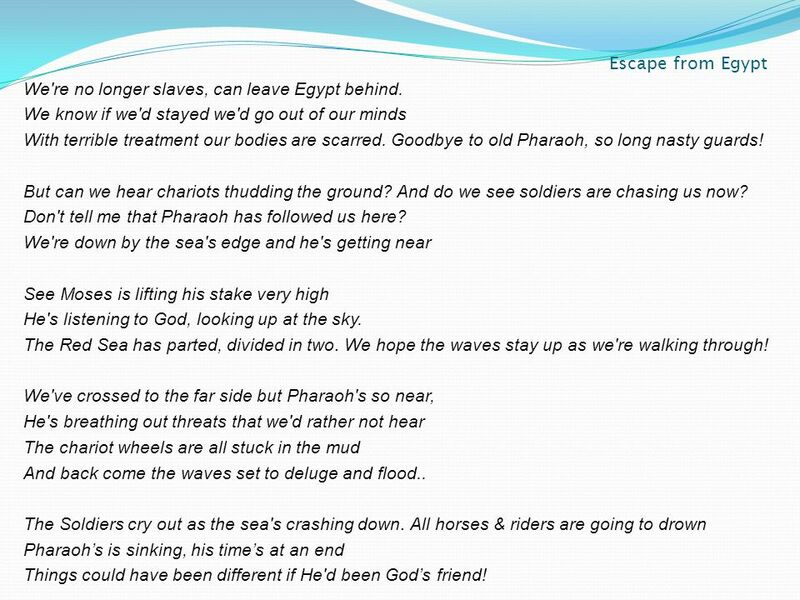 9 Escape from Egypt We're no longer slaves, can leave Egypt behind. We know if we'd stayed we'd go out of our minds With terrible treatment our bodies are scarred. Goodbye to old Pharaoh, so long nasty guards! But can we hear chariots thudding the ground? And do we see soldiers are chasing us now? Don't tell me that Pharaoh has followed us here? We're down by the sea's edge and he's getting near See Moses is lifting his stake very high He's listening to God, looking up at the sky. The Red Sea has parted, divided in two. We hope the waves stay up as we're walking through! We've crossed to the far side but Pharaoh's so near, He's breathing out threats that we'd rather not hear The chariot wheels are all stuck in the mud And back come the waves set to deluge and flood.. The Soldiers cry out as the sea's crashing down. All horses & riders are going to drown Pharaoh’s is sinking, his time’s at an end Things could have been different if He'd been God’s friend! 10 Celebration Song We're free from Pharaoh’s evil rule, and only just escaped! Our mighty God has rescued us, so let us celebrate! We thought we'd never get away. Our life has been so tough. But here we are and life is good! We can't thank God enough! Hallelujah, hallelujah! Sing praises to our King! Hallelujah, hallelujah! Our God’s amazing! Hallelujah, hallelujah! Sing praises to our King! Hallelujah, hallelujah! Our God’s amazing! 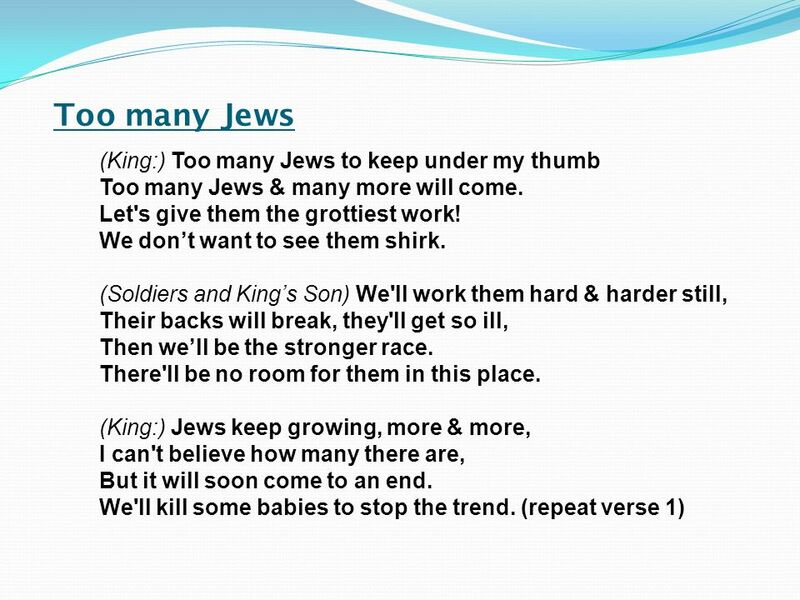 Download ppt "Too many Jews (King:) Too many Jews to keep under my thumb Too many Jews & many more will come. Let's give them the grottiest work! We don’t want to see." Victory Chant Hail Jesus! You're my King! Your life frees me to sing I will praise You all my days You're perfect in all Your ways. Our Torah Connections 11 Welcome Yeshua’s Yeladim. We Love You!  Please don’t talk when others are talking.  Please raise your hand if you would like to ask a question.  Please keep your hands and. Exodus The Deliverance of God. 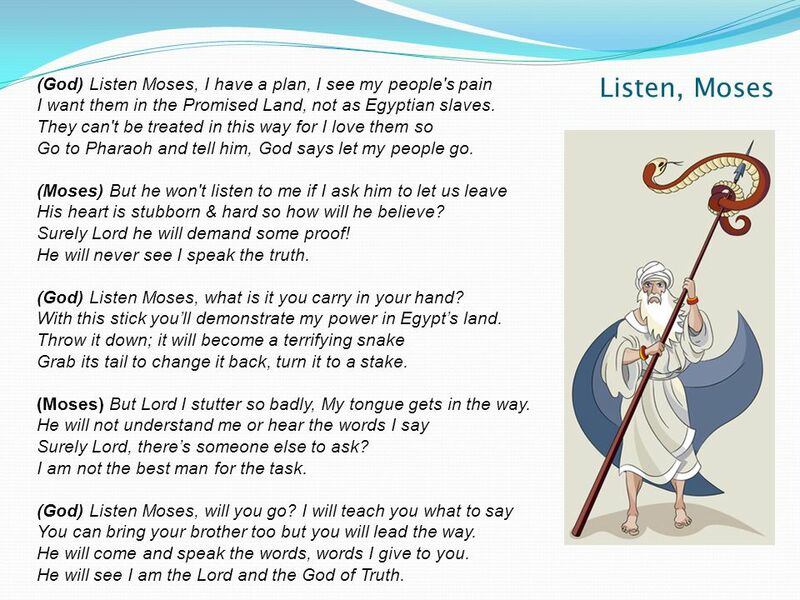  Exodus 1 – a continuation of Genesis  Exodus 2 – God saving Moses  Exodus 3-4 – God calling Moses  Exodus 5-6. 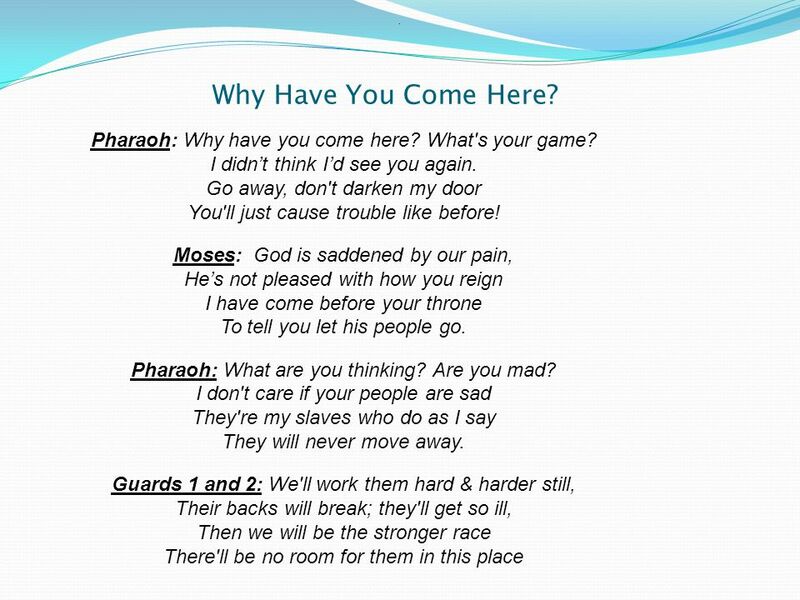 Exodus 7 – 13 The conflict between Pharaoh 10 Plagues Passover. 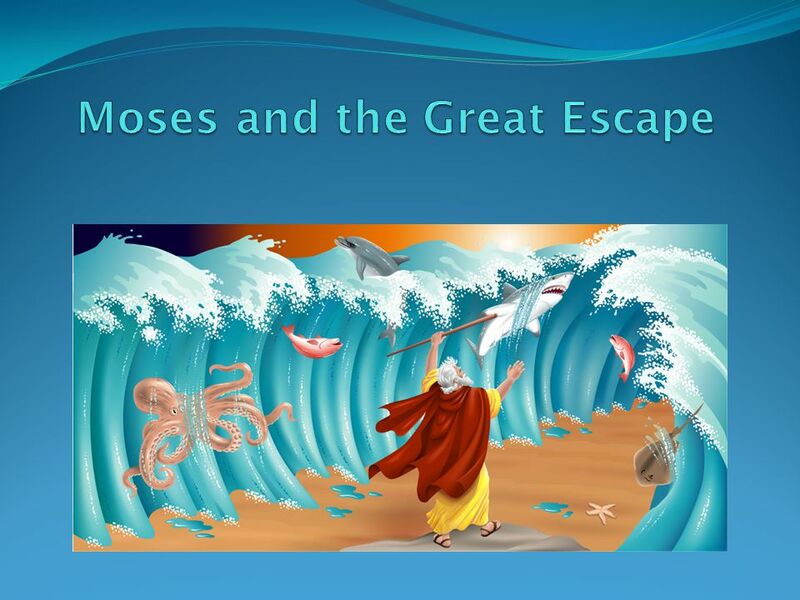 Moses and The Ten Plagues. One day, when Moses was moving the sheep, he came to Horeb, which was the mountain of God. An angel appeared in the flame of. The 10 Plagues Of Egypt. Know that the Lord has set apart his faithful servant for himself; the Lord hears when I call to him. Psalm 4:3 #7. Exodus 6:28–7:24 Staffs, Snakes, and Magicians. Faith or Unbelief: Our Response to Christ Hebrews 3:12 – 4:3. Children Summer Camp 2007 Church in Toronto. GREAT LENT - 3RD WEEK New month started … COME & CONFESS!